I’ve eaten at Mantee five times in the last six weeks. I got a huge crush on the place the first time I went and now it’s turned to love — the real deal. Okay, you get it. This is my new favorite restaurant. Quaint, sweet, lovely, romantic, warm, friendly, casual and completely unpretentious. And the food? A scrumptiously original party for your taste buds. Mantee just east of Vineland. 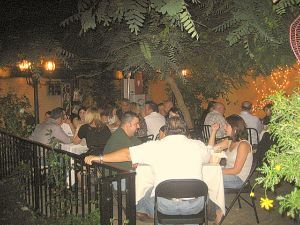 Free parking in back, romantic patio, BYOB and no corkage! 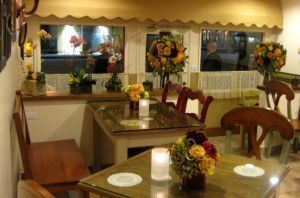 Located on Ventura Boulevard, just east of Vineland (free parking in back) in Studio City, it’s reminiscent of a charming little bistro you might stumble upon off a beaten path somewhere in Europe. The interior is very small — a handful of wood French country style tables fill the room with paintings on the wall. It’s cozy and comfortable. But the real magic is when you walk outside to the patio seating. 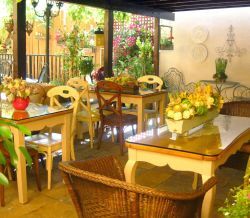 One half of the patio looks like an outdoor room, while the other half is full of tables nestled under trees. There are potted plants all around, which adds to the greenery. At night, there are twinkling white lights that make it festive and lovely — and a few black iron European-style street lamps that add to the charming ambiance. An eclectic range of music plays over the speakers. The cuisine is Armenian-Lebanese and far more interesting than any other type of Middle Eastern or Mediterranean fare I’ve eaten — in America, at least. Plus, Mantee got a bunch of big thumbs up from some very knowing Armenian friends as well. Well, with a place that personally makes me so happy, I couldn’t agree more. And after all, weren’t some of the most successful businesses built during times of distress? 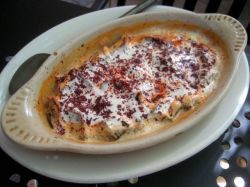 The namesake dish of the restaurant, Mantee, is a traditional Armenian specialty of Turkish origin that can best be described as a type of small ravioli or dumpling. Also spelled manti, it’s their signature dish and offered with a choice of meat (lightly seasoned ground beef) or vegetarian (seasoned spinach with lemon). Formed into small boat shapes, the mantee is soft with a bit of a crunchy bite, smothered with garlic sauce and seasoned with sumac and red pepper. Order it as is, and not with the sauce on the side. Beef, chicken and lamb entrees are offered at Mantee, and all are good ($11.95-$14.95, although not large portions), however, it’s the small plates ($4.55-$8.50) with a combination of meat and vegetarian choices that are the big draw — and what makes the dining experience so magical. The small plates are meant to be shared, and with nearly 30 from which to choose, come with a crowd, order at least five small plates for two people, or just come back often. If you order an entree, share that as well, so you can afford many different tastes of the dishes available. As soon as you are seated, you are given a large basket filled with toasted and fresh pita, along with a small serving of a dipping sauce made with sesame seeds, olive oil and anise. The Fattoush salad is a must to start. 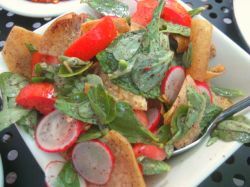 A combination of tomato, radish, mint, onion, crushed wheat, and fried (or toasted) pita bread, it has a green leafy vegetable called purslane, which is used instead of lettuce, and mixes beautifully with the mint and a tart lemon/olive oil dressing. There are five different types of hummos — the traditional chick peas blended with sesame paste; and others with: sautéed pine nuts, sautéed beef filet, a combination with pine nuts and filet, and grilled Armenian beef sausage. 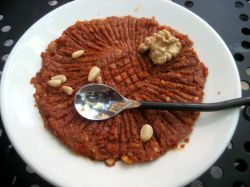 Mohammara, made from pomegranate molasses, red pepper paste and crushed walnuts, is pungent with the consistency of a paste and wonderfully flavorful. Motabbal is very much like Baba Ganoush, but here it is preferably thickened with more eggplant than tahini. The Dolma is completely different than those found in Greek restaurants. The Mantee version is a sliced and hallowed Asian eggplant stuffed with rice and a light tomato sauce. It can be ordered with or without yogurt sauce. Both are divine, but the yogurt makes it extra special. They do serve Sarma, which are grape leaves stuffed with rice that are also excellent, but the Dolma is unique and a step above. Cheese lovers unite, there are a few dishes for you — Hot Feta that has been baked in the oven and topped with tomato and jalapeno, Sue (or Soo) Berag — a pasta pie filled with cheese and parsley, and Grilled Halloom (grilled Cypriot white cheese). There are also more classic Armenian dishes, such as variations of Soujuk (Armenian beef sausage) with tomato sauce, quail egg and pastrami. There are heat lamps on the patio, but go now while the weather’s warm so you can be sure to have your first Mantee experience outside. Mantee does not serve alcohol, but that’s a good thing — it’s BYOB without a corkage fee. You can’t beat that. They’ll supply plastic cups and a corkscrew. Stop by Trader Joes on the way. If you prefer to drink wine in a glass, feel free to bring your own – but personally, the plastic adds a certain kitsch that’s fun. (NOTE: Since this writing, no alcohol is allowed brought into Mantee. A liquor license is pending). UPDATE: MANTEE NOW HAS A LIQUOR LICENSE AND SERVES WINE AND BEER. The full menu is available at lunch, but there is also a sandwich option that makes dining much more reasonable. Perhaps share a Fattoush salad ($5.95) and choose from Shish Kebab (marinated charbroil filet) , Chicken Kebab (marinated chicken breast), Kafta Kabob (charbroiled seasoned ground beef), Soujuk Panini (Armenian beef sausage), and Halloom Panini (cyriot white cheese) $6.95-$7.75. I’m totally committed to Mantee. I hope they’re here to stay. 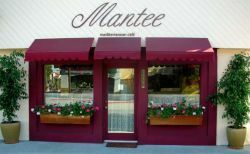 Mantee is located at 10962 Ventura Blvd Studio City, CA 91604 (818) 761-6565 www.ManteeCafe.com Tue-Thu. 11:00 a.m. – 9:30 p.m. Fri-Sat. 11:00 a.m. – 10:00 p.m. Sun. 11:00 a.m. – 9:30 p.m. Closed Monday. Free parking is available in back (take the alley off of Vineland). Reservations suggested, especially if you want the patio for dinner. I second this! The food is fantastic! An awesome dining experience! Mantee sounds delicious and I can’t wait to take the family! Yummy!! It’s a perfect date night too. Since it’s BYOB without a corkage fee, it makes it a much more reasonable evening out! How great to know there is a new Armenian restaurant in my own neighborhood. 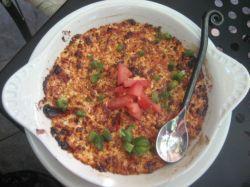 I make many of these dishes myself and several of the recipes are in my culinary memoir. But Manti itself is labor intensive and so delicious. Thanks for the great review. I can’t wait to try it. This sounds delicious and it looks so charming! I want to go TONIGHT! Love to find family owned, community places. Thank you. Excellent food and a relaxed atmosphere made for a wonderful evening out with friends last night. The outdoor patio was beautiful, and even on a cold-ish December night, the heaters kept us cozy and comfortable. The service is warm, friendly and inviting. This would be a perfect place for dinner before a Hollywood Bowl concert (close to the Bowl Park & Ride) or before heading downtown via the Universal Metro stop. We will definitely return. We have started our operation only 5 months ago, and we are doing well. Just need to tell you that MyDailyFind helped us a lot to reach that success.